Letting your kids listen to and read stories is a treat you can never let them have too much of. Of course a reading of a beautiful story will also keep them entertained during car rides or lazy weekend moments. Here is The Smell Thief by Joanne Bloch and illustrated by Mieke van der Merwe from the Nal'bali reading-for-enjoyment campaign. Listen to The Smell Thief here or read it below. Mr Shabangu was the best baker in town. Every morning he woke up at four o’clock to mix and knead the dough for his famous buns, cakes and biscuits. By eight o'clock the people of the town were walking past the bakery on their way to work and school. By this time the cakes and buns were almost cooked, and the most delicious smells wafted out of the bakery’s windows. Many of the people went into the bakery to buy their breakfast. Mr Shabangu smiled happily at them as he passed them the fresh, tasty cinnamon buns and warm, golden biscuits that were so famous in the town. But other people were not so lucky. Because they had so little money, the poorer people of the town could hardly ever afford to buy any of the delicious buns, cakes and biscuits. All they could do, was enjoy the lovely smells that drifted out of the bakery windows. 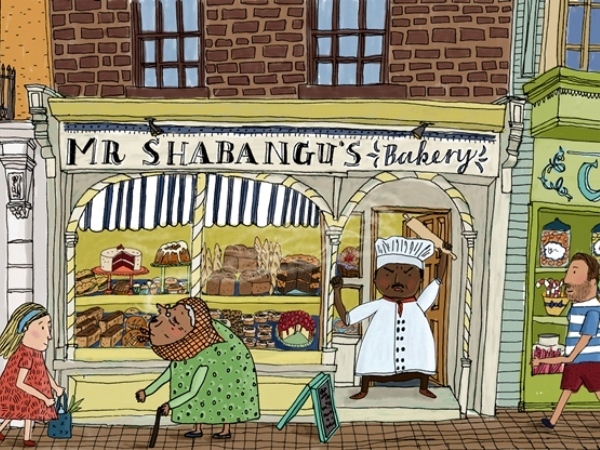 When Mr Shabangu noticed these people sniffing the air near the bakery, it made him furious. ‘How dare they sniff my delicious smells!’ he said to himself angrily. ‘Those are MY smells. I made them, so they belong to me! If people want to smell my wonderful smells, they should pay for them!’ He huffed and puffed and wiped the sweat from his brow, before turning back to the oven to bake some bread and rolls for his lunchtime customers. One old woman especially loved the smells that drifted out of the bakery window every morning. This was Ma Shange who slept on a bench in the park every night. A few weeks before, a kind person had given her the money to buy herself a cinnamon bun. She had taken the bun back to the park and eaten it very slowly, smacking her lips and sharing the last crumbs with the birds. After that, although the old woman didn’t have enough money to buy breakfast, she remembered the delicious bun. So every morning she walked slowly past Mr Shabangu’s bakery, sniffing the air and smiling blissfully at the mouth-watering smell. Ma Shange’s new habit made the baker very angry. As each days went by, he grew angrier and angrier with her. Finally, one wintry morning when he was in an especially bad mood, he stormed out of his bakery and grabbed the old woman by the arm. ‘How dare you steal my smells!’ he shouted. ‘You’re nothing but a smell thief!’ He wiped his hands on his apron, then pulled it off and threw it back into the bakery. ‘Look after the bakery!’ he shouted at his assistant. ‘This is the last day this cheeky woman will steal my smells!’ And with these words, he dragged Ma Shange off to the court to see Judge Ngwenya. The judge was just sitting down at his huge, shiny desk when the angry baker stormed in, dragging the quivering and confused Ma Shange with him. ‘Good morning,’ said the judge in his deep voice, but Mr Shabangu was too angry to even greet him. The judge scratched his big, bald head for a moment. Then he cleared his throat. ‘Fair enough,’ he said to the baker. ‘Justice will be done.’ He turned to Ma Shange. ‘How much money do you have on you, Madam?’ he asked. ‘Only two rand, your Honour,’ stammered Ma Shange. This story was provided courtesy of the Nal'ibali National Reading-for-Enjoyment campaign – aimed at sparking children's potential through reading and storytelling. For more information, reading tips and story ideas to share with your children or reading clubs, visit http://nalibali.org/or find them on Facebook or Twitter.